A few years back, I had a reputation for both hyperbole and waffling that would put John Kerry to shame. Friends still needle me about a particularly catastrophic flip-flop over Person Pitch, which, upon listen No. 5, turned from a princess to a pumpkin in a puff of marijuana smoke. So I’ve changed, or tried to, which is why I regret a tweet calling Fleet Foxes’ Helplessness Blues amazing. It comes close at times, particularly on the stirring title track, but with each spin, it’s the band that sound themselves increasingly helpless — too freaked out to embrace their musical strengths, too intent on “growth” to remember why they aren’t playing lead guitar. The (perceived) pressures of fame have neutered plenty of bands: Broken Social Scene have never returned to the flawless heights of You Forgot It In People; the National’s High Violet sounds at times like a band satire by people who hate the National; the list goes on. Fleet Foxes are pretty close to the top of the crossover ladder here, with a debut that sold an absurd 400,000 copies and gained a serious mainstream boost from a Starbucks placement. Having trouble reconciling your D.I.Y. ideals with buying the really good produce at Whole Foods is to be expected. (Amongst all these acts, perhaps only the long-running Spoon has gotten better with increasing popularity.) But let’s start this story at the beginning. Fleet Foxes, seemingly everyone has forgotten, have a prologue: the Crystal Skulls, the Seattle indie-pop group that was very nearly the second coming of the Shins and Beulah. But the songs weren’t quite there and the fanbase certainly wasn’t, so singer Christian Wargo and keyboardist Casey Wescott hitched their apple wagons to a college-age vegan named Robin Pecknold’s star. 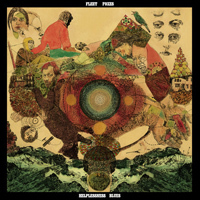 In itself, that’s fascinating — submerging your ego to let an untried youth run your new band — but the Skulls’ influence extends throughout the early Fleet Foxes catalog, especially on the less Crosby, Stills & Nash-y tracks of their pre-Sub Pop EP. (However, it’s unclear from my research if the Skulls members were yet on board for that 2006 set.) When the band released its superb debut album, it hummed with songwriting confidence and new-band hunger; its best song, “Blue Ridge Mountains,” combined ’70s harmonies with indie-pop lead guitars in a downright nuclear fusion. But Helplessness Blues sounds like the Skulls no longer. For an album that apparently took a Herculean exertion to create, most of it doesn’t sound like it’s trying very hard: where “White Winter Hymnal” opened immediately with a whale-sized hook and escalated accordingly, “Montezuma” begins with a guitar arpeggio and Robin’s lonesome voice. When the band enters, it’s as a needless choral harmony, not the exciting blend of voices that characterized the melodies of Fleet Foxes. After a pair of oatmeal-bland verse/chorus repetitions, the song dives into a bridge. Guess what, it’s guitar chords! The lyrics are even worse: “So now I am older / than my mother and father / when they had their daughter / now what does that say about me?” It says you’re going to have kids in your 30s like everybody else, you over-neurotic wiener. Perhaps a few philosophy classes (or at least some late-night dorm discussions) would’ve helped Pecknold deal with the modern world; when he turns to more image-rich material, the lyrics sing, but soon enough he’s begging for the nostalgic pleasures of physical labor without realizing he could quit the band and pick avocados for minimum wage, if he wanted a simpler life so badly. For the most part, the music’s self-satisfied trad-folk blandness and the indulgent urban farmer songwriting comes across as a pale attempt at Midlake’s The Trials of Van Occupanther, a gloriously arranged and intelligently considered look at romantic failure amid the longing for simpler times. Helplessness Blues isn’t a Pecknold solo album, but it feels pretty close. The last vestiges of the Crystal Skulls shine forth in the welcome lead guitars of “Grown Ocean,” the album’s title track and one of its better moments. But Pecknold himself put it best in an Guardian article, calling the set “less poppy”: “As a whole, it’s probably a little bit less upbeat. Not darker – some of it has a more exuberant feel. But some of it is just more realistic … I guess people think we’re already a mellow band, so maybe the next album will be pretty boring to most people.” Despite a handful of great moments, I wish I could say he was wrong.